If you haven’t seen the museum’s two big summer shows—Hiroshige’s City: From Edo to Tokyo or Art in a Time of Chaos—this week is your last chance. Art in a Time of Chaos shows a side of Chinese history that has never been seen before. The juxtaposition of Northern and Southern Chinese tomb artifacts at the entrance of the exhibition offers insight into the differences between Northern and Southern Chinese cultures of Six-Dynasties China. Meanwhile, artifacts in the rear of the exhibition provide evidence of intercultural mingling between China and Persia. 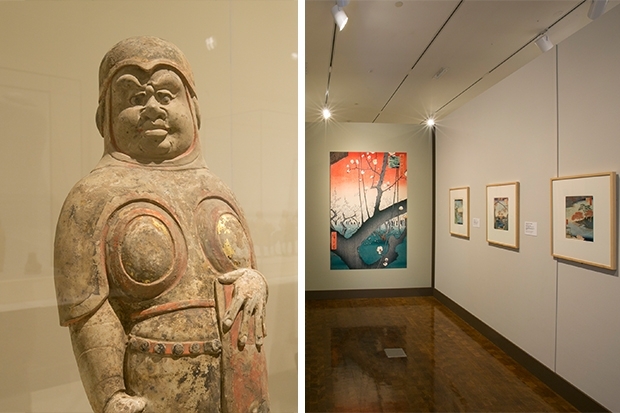 For more on those works, read Asian art curator Shawn Eichman’s Curator’s Notes blog posts on Art in a Time of Chaos parts 1, 2, and 3. The museum is home to the largest collection of woodblock prints by Utagawa Hiroshige in the world—which gives the museum the freedom to curate Japanese print exhibitions in ways no other museum is capable. In Hiroshige’s City: From Edo to Tokyo, curator of Japanese art Stephen Salel presents works from Hiroshige’s renowned One Hundred Famous Views of Edo series in a way that illustrates the evolution of the world’s biggest megalopolis from a marshy wetland to a sprawling hub of economic activity. For more on Hiroshige’s City: From Edo to Tokyo read Salel’s Curator’s Notes blog post.